Christmas shopping – Order in time for the Holidays! Living Life Fabulous at Fifty: Affirmations for Women of Color! 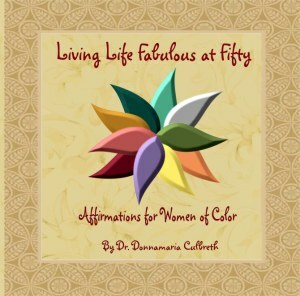 Living Life Fabulous at Fifty: Affirmations for Women of Color is a new book by Dr. Donnamaria Culbreth that focuses on women of color transitioning into and living life in their fifties as they re-balance and embrace their psychological, emotional, physical, and social well-being. The fabulous fifties is a time for women of color to celebrate, rejuvenate, enhance, and empower themselves to begin living life fabulous! Filled with positive affirmations designed to help every woman of color transitioning into and living life in their fifties think, believe, and practice positive thoughts! As you read this book, prepare for an awesome change in the way that you think about everything! The power is within! Live Life Beautiful: Affirmations for Girls of Color: A book that every girl, pre-teen and teen must own! 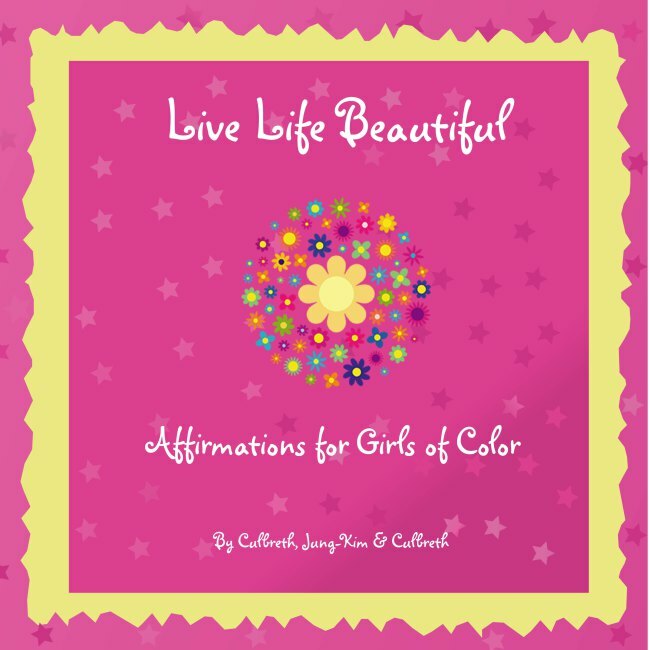 Buy your copy of Live Life Beautiful: Affirmations for Girls of Color today! Windsor Mill, MD — Live Life Beautiful: Affirmations for Girls of Color is a new book written by the founders of I Am Beautiful Global, Inc. (IAB). It is the first book to equip girls of color with the Foundation Elements of Beautiful (self-love, self-esteem, self-identity, self-pride and self-respect); encouraging words in the form of positive affirmations, and a concept to live life beautiful. The book contains 250 positive affirmations and explanations written specifically for girls of color as a self-help/motivational guide to live life beautiful. Dr. Culbreth also noted, “We live in a society where we often hear stories of how girls of color are negatively labeled, stereotyped, often ignored, and treated disparately both consciously and unconsciously. Such treatment can and does affect their psychological, emotional, physical and social well-being. Affirmation topics include colorism, hair, standards of beauty, cultural identity, cultural pride, diversity, ethnicity, education, friendship, making good choices, self-love, self-esteem, self-respect, self-pride, self-identity, bullying, and STEM among other topics. By thinking, believing, and applying positive thought processes, the lives of girls of color will be transformed and as their inner beauty begins to radiate on the outside, they will live life beautiful. Ada Elizabeth Culbreth, co-author, noted how the book encourages girls of color to embrace, love themselves and to reach for the stars. She says, “Believing in themselves and their ability to reach higher ground in life is paramount for every girl of color throughout the world.” Live Life Beautiful: Affirmations for Girls of Color encourages girls of color to learn, embrace, believe, think, practice, and apply positive thought processes to change self-perceptions, attitudes and behaviors. The paperback edition of Live Life Beautiful: Affirmations for Girls of Color is available for purchase through Complexity Publishing, LLC. The e-book version is available at BarnesandNoble.com, Amazon.com, and Goodreads as well as other e-book websites. Dr. Donnamaria Culbreth is the Chief Executive Officer of IAB and believes in empowering girls and women of color to reach higher ground in life. She focuses on encouraging them to embrace being beautiful on the inside and outside, the importance of positive thought processes, embracing diversity, to live life beautiful by focusing on the foundation elements of beautiful, to dream in color as they reach for the stars, and to believe in themselves. She focuses on girls and women of color defying negative stereotypes and breaking down skin color and racial barriers and biased standards of beauty that continue to ignore the diversity of girls of color. Dr. Culbreth is the Editor-in-Chief of the Journal of Colorism Studies, author of Living Life Fabulous at Fifty: Affirmations for Women of Color, and founder and president of the National Girls and Women of Color Council, Inc.
Dr. Julie Jung-Kim currently serves as the Chief Operating Officer of I Am Beautiful Global, Inc. and believes that IAB recognizes the negative impacts that girls are facing on a daily basis and believes it is vital to walk with them to redefine beauty for themselves – on their own terms. Through this type of mentorship, IAB hopes that girls of color will know how truly BEAUTIFUL they are. Dr. Jung-Kim is also Editor of the Journal of Colorism Studies and Living Life Fabulous at Fifty: Affirmations for Women of Color. Ada Elizabeth Culbreth is the Chief Marketing and Public Relations Officer of I Am Beautiful Global, Inc. She believes in empowering girls and women to reach higher ground by building a solid foundation for life-long learning. The authors are available for motivational speaking engagements, interviews, media appearances, presentations, workshops, and/or book-signings. Contact Complexity Publishing, LLC at publicity@complexitypublishing.com. In light of the recent issues involving racism on college campuses, I wanted to share the archives of two shows from March 2015 focusing on The Hidden Prejudice in Education and Racism on College Campuses hosted by Dr. Donnamaria Culbreth and Dr. Julie Jung-Kim. We identified the issues and hit the nail on the head- straight with no chaser – and definitely not sugar-coated. Listen to the archives below.